Based on the manga series by Hirohiko Araki, Jojo's Bizarre Adventure: All Star Battle is basically a love letter to the series' multitude of fans. If my private twitter account is any indication, ever since the game was initially announced last year, every subsequent announcement and teaser about the game has been met with an overwhelming positive response from the online Japanese fanbase. The included characters, the incorporated memorable poses and quotes from the original series, and the combat system and balance that pays homage to the series that has been continuing to build its legacy for over 25 years… Fans have been ecstatic. The fan expectations for the game could only be matched by the expectations of the development team. The developers at CyberConnect2 poured their hearts and souls into making the game a geekgasm for the fans it's aimed at. According to an interview with Weekly Famitsu, over 10,000 character poses from the manga series have been incorporated into the game, with countless retakes on character models to make them as accurate as possible. Of the many hurdles in developing the game, one of the biggest (aside from letting the dev teams own fandom and need for perfection get in the way of development) was the inclusion of the series' latest ongoing chapter, JoJolion. Because the series and all its plot developments and twists were still happening as during the game's 2-year development run, it led to many last-minute additions and changes. Apparently, one of the series' protagonists, Josuke Higashikata's victory pose was added to the game only 2 months before the official release because of the manga. Even more impressive is the fact that the staff were such fans that they added the victory pose even before the game director saw it in the manga and requested it be added. 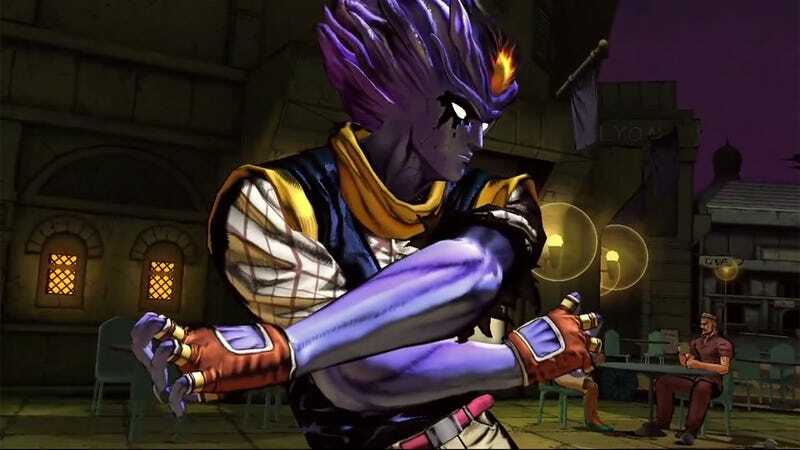 The game's latest trailer has also gotten fans worked up with the announcement of several new downloadable characters, including Baoh, the protagonist of Baoh: The Visitor, the manga that Araki wrote before he started JoJo. Speaking of DLC, however, the game's publisher is Namco Bandai, a company notorious for its gratuitous overuse of DLC in almost all its games (They're STILL releasing DLC of THE iDOLM@STER 2　EDIT: DLC for iDOLM@STER 2 has ended... nearly 2 years after the game was originally released. Thanks for the info zerorush!). Sadly, All Star Battle has not been able to escape the Namco Bandai DLC business model. A photo of some of the game's DLC has appeared online, showing a list of non-character DLC items for use in the campaign mode with varying in-game effects. The blatant nickel and diming of gamers is being regarded in many online communities as a slap to the face of those who have paid full price for a game they've been excitedly waiting a year for. JoJo's Bizarre Adventure: All Star Battle is currently in stores in Japan. Currently the game is only available for the PS3. No news on an international release. Stay tuned for Kotaku's official review of the game.